Will there be a Mixer module in the future? Sometime in the future probably (if no one beats me to it), though I have no immediate plans. will there be a discord module for this? BlayTheNinth Amazing mod! If it isn't too much to ask, when do you have plans on updating the mod to 1.11.2? Thanks! I'll be back to modding starting Friday this week, so sometime after then. Is this compatible with Tabby Chat? Am I the only one annoyed at time-stamps for the feed back on help commands? Is there a way to remove the time-stamp from only those but to leave it on everything else while keeping it in the same tab? Hello I have a quick question about formatting. How would I format this (when clicking on a tank) and similar occurrences (like clicking on a no-interface capacitor that prints RF: x/x to chat) so that it can be displayed in "Bottom" instead of chat? "Tank: [0-9]+ \/ [0-9]+" (without quotes) as Pattern should work. I recommend Regexr as a tool to build and test these patterns, it's really good. Late reply, but still, thanks! Hi I am having an issue for some reason. I bunch of random characters are after my name in the chat. I can not figure out what to do to change it. Here is the picture. Any help is appreciated. Also is there a tutorial or anything on this mod? I do not understand the pattern or format. So I am not sure how to make it the way I want. Thanks! http://regexone.com/ looks like a nice way of learning Regex. http://regexr.com/ is a quick way to test stuff and comes with a reference. You use that to match patterns. 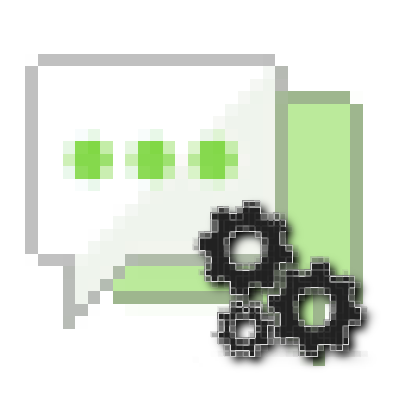 If you specify a sender and a message, those can be used later in the message format section. The format is more straightforward. Clicking the question mark next to Message Format shows you some tags you can chain together to make you message output look the way you want it to. Not sure what's up with the weird characters there. Do you have any other mods installed that are changing your nick, like adding colors or something? I love the functionality provided by the mod I but have a few issues. 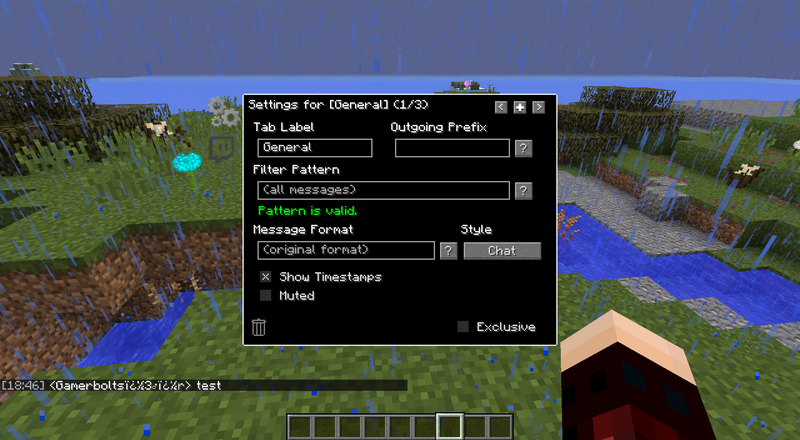 Bug: When I use the in game config editor (mod options -> betterminecraftchat -> config) it duplicates all of my channels. Bug: When I use the in game config editor, my settings are not saved. They are reset if I restart minecraft. Bug: Emotes show up in the wrong spot. This might be because I am using a custom font resource pack (optifine + lithos core). Suggestion: It would be great if you could change the order of the channels in-game. You can already change the order by editing config/BetterMinecraftChat/channels.json however an in-game option to manage the channels would be nice. Issue: The exclusive checkbox seems to have no effect. Messages caught by channels set to exclusive are also caught by other channels. Edit: It appears that if the server sends the client a message beginning with (or even containing?) a newline character, the mod causes the client to not receive the message at all. In fact, if the mod is installed that message will not even appear in my client chat logs! Here is an example of an ignored message. Thanks for the feedback, I will have a look at these when I'm un-busied. So this is basically the 1.9 version of EiraIRC, but it can't use IRC? There is no EiraIRC for 1.9. This is a different mod.